NAP4 is the largest study of major complications of airway management ever performed. A year-long national service evaluation, endorsed by all four Chief Medical Officers of the UK, collected data between September 2008 and August 2009. 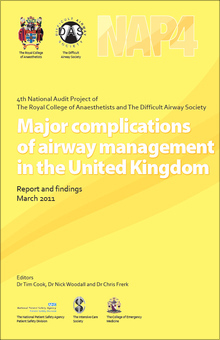 NAP4 captured detailed reports of Major Complications of Airway Management in the UK. Cases were captured from all NHS hospitals in England, Scotland, Wales and Northern Ireland. Cases from Anaesthesia, Intensive Care Units and Emergency Departments were included. Admission to ICU (or prolongation of stay if already on ICU). 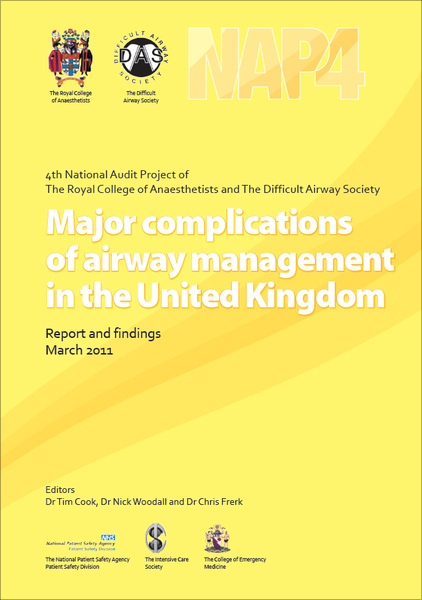 NAP4 also surveyed anaesthetic departments to identify the number of general anaesthetics performed in the UK and how the airway was managed during these cases. NAP4 was funded by the RCoA and the joint project partners the Difficult Airway Society. NAP4 was launched with a series of lectures in March 2011. There are several papers and a report produced presenting and discussing the findings. All are freely available without restriction. During the year 309 hospitals participated and 184 reports were received. These included reports of 38 deaths and 18 other cases of permanent harm. All 184 cases were reviewed in detail to identify new information and learn from these events. The report includes 168 recommendation intended to impact on national, local and personal strategy and practice in the area of airway management in order to improve patient safety.